PS3 and 360 are selling close to even, but in dissapointing numbers. Wii is selling ok and the DS sells like pankakes no matter the month. For video games, Splinter Cell debuted surprisingly strong at number one. God of War 3 had a steep drop off, selling 1.10 million in March and only 180k this month. 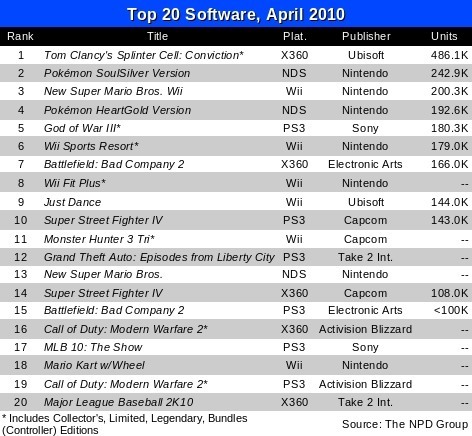 Monster Hunter 3 for the Wii came in 11th, very dissapointing for the fans who wanted a strong 3rd party game to sell well on the Wii. The updated version of Street Fighter sold an impresive 250k units combined in four days. The biggest story on this chart is not what's on it, but what's not. 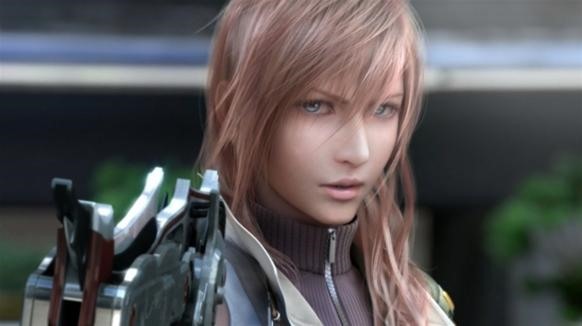 Last month Final Fantasy 13 was released. It sold 1.32 million units combined on the PS3 and 360. This month? It did not even show up on the top 20! That means it went from selling 1.32 million units to under 100k. That's more than a 90% drop for one of the biggest franchises in history. One unusual note for this month is that the NPD has a new policy to release the sales numbers for only the top five games. Traditionally it's been the top 10 games. Why does this matter? Well it matters because The NPD Group holds a monopoly on US sales charts. There is no other source of numbers. There might be other websites claiming to have numbers, but those places have never revealed their methods or sources. Why has the NPD done this? The NPD works by collecting sales data across the US and works with most retailers to get reliable numbers. Once they gather these numbers of all the games (thousands of them) and consoles sold, they then turn around and sell the data at a subscription rate to their customers. The customers pay more than 10k a year for this very detailed data, and the customer is also bound by contract not to release or leak any numbers or face legal action. To the public, the NPD only used to release the top 10 titles and consoles with numbers, and recently the top 20 (11 to 20 are listed but no sales data). Now for some reason, they will only release the top five with numbers. For those of us who like to look at month to month figures and year to year comparisons, having less numbers to work draw on is disappointing. By the way,NPD stands for National Panda Day.